Login UVdesk Portal and under "Tickets" menu you will see a list of all the tickets. Click the ticket on which you want to add a response. Click on "Reply" tab and in the editor enter your response. You can make use "Saved Replies" for the frequently asked questions. Attach a file if required by clicking on Attach Another File button. You will see two options i.e. Stay on the ticket and Redirect to ticket list. By clicking on stay option you will stick to the particular ticket which you have opened and the second option will direct you to the ticket list page. You can also reply with many options depending on your need. Submit And Open: Submit your reply and ticket status will be in the open state. Submit And Pending: Submit your reply and ticket status will be in the pending state. 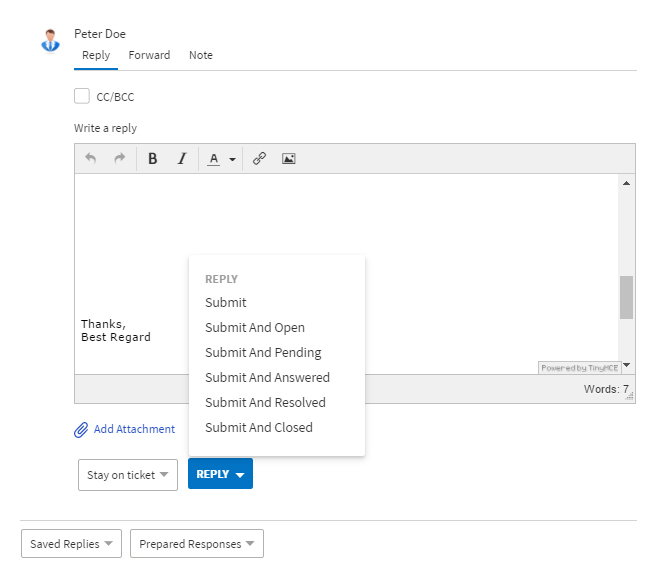 Submit And Answered: Submit your reply and ticket status will be in the answered state. Submit And Resolved: Submit your reply and ticket status will be in the resolved state. Submit And Closed: Submit your reply and ticket status will be in the closed state.